Sales and marketing either don’t mix well together or other companies see them as one in the same. Well, they’re not. 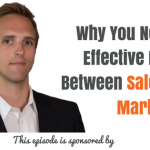 Sales and marketing are two different things. However, they have to align in every step so you can make the buying process for customers both beneficial to them and to you as a company. I’m bringing in Tracy Eiler on the show today as she shares with us a ton of insights from her book Aligned to Achieve: How to Unites Sales and Marketing Teams Into a Single Force for Growth to help us understand the power of aligning sales and marketing in any business, big or small. 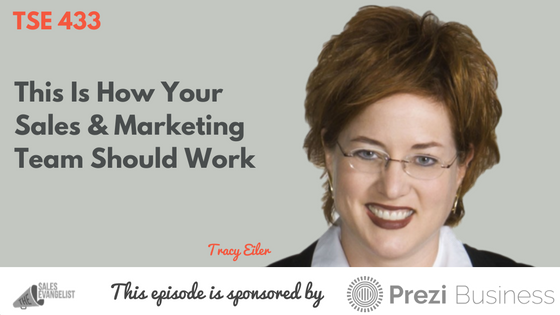 Tracy is a lifelong B2B marketer where she has spent most of her time in technology companies and helping businesses figure out a way to get the biggest deals and make their sales teams the most productive. Her mantra is that marketing exists to make sales easier. She is currently the Chief Marketing Officer of InsideView, a Market Intelligence Platform solution that produces results across sales and marketing operations. The buyer has changed a lot. Buyers are more in control of the buying cycle, doing their research online before they even approach a company. They’re not making themselves identifiable to sales and marketing but they’re much more informed when they do come to you. Proliferation of technology for sales and marketing. There too many choices in technology now. Most of the sales and marketing teams receive different reports from tools in the market place. They’re not measuring the same things and they’re getting in their way. This is a practical meeting where you discuss what has just happened in your marketing campaigns with sellers and what’s happening at this moment. This is an opportunity for marketing to show sales some concepts, how they’re doing it and get their opinion. The more transparent marketing can be with sellers, the better relationships there’s going to be. This gives sellers an opportunity to get some of their creative ideas in front. Retention is an example of a metric you could use. The main focus is whether you bring customers in or not? Tracy believes marketers should be measured by pipeline. Marketing delivers some set of qualified leads that have met the criteria you’ve all agreed on. The traditional marketing funnel model is obsolete. There are so many businesses that are based on subscription services, for instance, where the expansion of customer relationship is constantly moving around. They could be found along the different points of the sales process (ex.engagement, closing, growing) so the cycle just continues and continues. Hence, there are a lot of processes go throughout this new funnel. Every step of the process must have definitions and hand-offs. You need to agree on what a lead is, what makes that app, and agree on that definition. Also agree on the hand-off between marketing to sales to make sure it’s clean. Every hand-off process needs to be examined every step of the way. Both sales and marketing should understand what it takes to get a complete stranger to become a customer. There are a number of tools now that you can use to penetrate accounts more broadly. But there is an overlooked piece for account-based marketing which is the data strategy. This means you have to have an agreed-upon set of accounts that you need to go after. Connect with Tracy on LinkedIn or send her an email at tracy.eiler@insideview.com or visit www.insideview.com for more information and resources. Thank you for the article. I feel the same way. It’s all about working for the betterment of the company, so why not at least try? Thank you again.